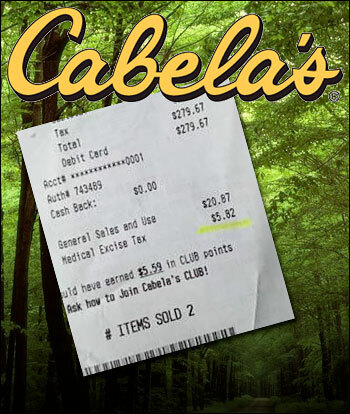 Editor’s note: After posting the story below, we discovered that Cabela’s has explained the excise tax addition to receipts as a “glitch” and it does not reflect an effort by the sporting goods store to highlight the expense to business of funding Obamacare. We at Infowars.com, however, believe it serves as a good catalyst to demonstrate how Obamacare is in fact a massive tax scheme designed to further bankrupt the American people. CNN, MSNBC, the New York Times and other apologists for government theft naturally don’t expose the heavy dose of taxes hidden in Obamacare. One especially egregious tax as of January 1 is levied on people who use things like corrective lenses or hearing aids. Democrats need these kind of taxes to pay for their “free” healthcare scam. If you wear glasses, get ready to pay an additional 2.3 percent. In 2013, the “rich” – read: well-off people not well-off enough to be able to hide money offshore or in “philanthropic” foundations – will get reamed. In addition to capital gains tax rates rising (from 15% to 18.8%), there “will be an additional 0.9% tax on earned income in excess of $250,000 for families and $200,000 for individuals to help pay for Medicare Part A, which covers hospital stays, nursing facilities, and hospice care,” Alex Rogers writes for Time. Many of the taxes buried in the massive bill include excise taxes on charitable hospitals, taxes on innovator drug companies, new taxes on Blue Cross/Blue Shield, and other taxes that will of course be passed on to beleaguered consumers. Many of the taxes in the bill have nothing to do with healthcare. For instance, taxes on bio-fuel and tanning services. In 2014, anyone not buying “qualifying” health insurance – that is to say, not buying insurance from mega-corporations who cut a deal with the feds to fleece the average American – must pay an income surtax. Employers with more than 50 employees who do not conform to the Obamacare mandate will be obliged at gunpoint to pay an additional non-deductible tax of $2,000 for each full-time employee. If employees participate in so-called insurance exchanges run by the government, the penalty for the employer jumps to $3,000 per employee. Also in 2014, those of us who have “Cadillac” health insurance plans – plans that cost more than $27,500 per family – will face a withering 40 percent excise tax. Cabela’s is doing us a service by adding a medical excise tax line on its retail receipts. More retailers and service companies need to get on the bandwagon and do this. It will remind Americans that they are being screwed – not by rapacious fat cat corporations, but the federal government.